This Pork Stroganoff Stew is a delicious, hearty stew that is perfect for these cold winter days. 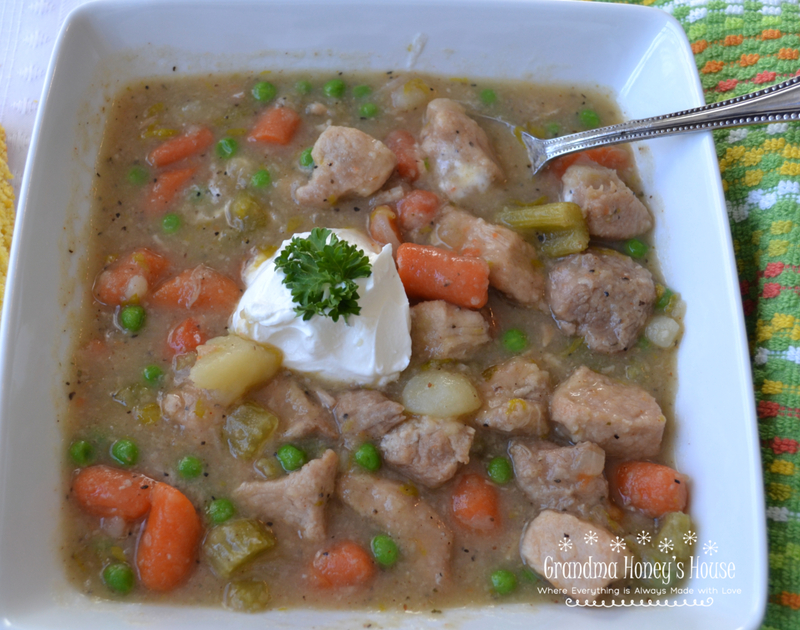 It is loaded with tender chunks of pork, carrots, celery, onions, peas and a blend of perfect seasonings. Stir in a dollop of sour cream for a stroganoff flavor. Our family loves traditional beef stew, and I make it frequently. I was in Sam’s Club one day and saw a big package of pork stew meat. This was not something that I had seen before, so I purchased it and could not wait to try it in a stew. 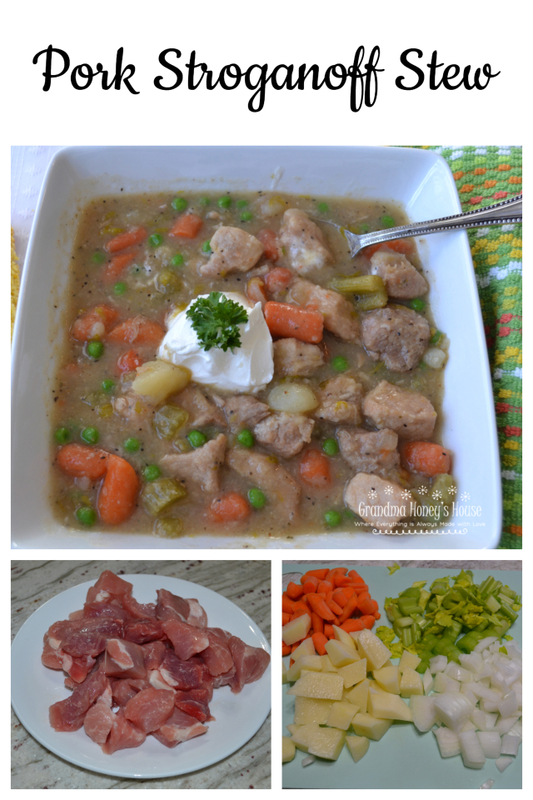 I did not have a pork stew recipe, so this recipe was one that I created. This pork stew meat was so tender. Roll the pork stew meat in flour, season and brown in oil heated in a dutch oven. Add chicken broth. Bake for about 45 minutes. Chop fresh veggies and add to pot. Bake until tender, about 45 minutes. Stir in frozen peas last 10 minutes. 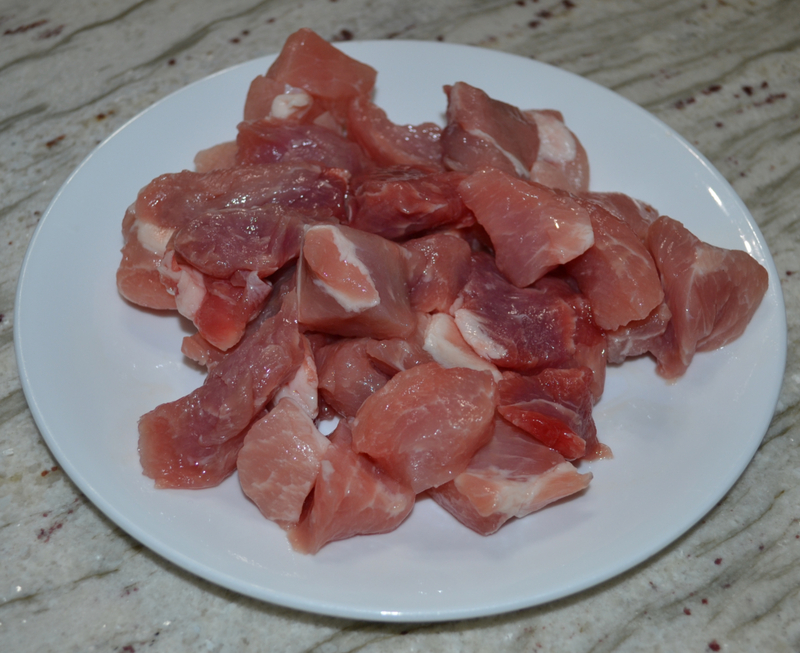 Prepare Pork Stroganoff Stew earlier in the day you will be serving, or the previous day. The flavors blend if allowed to set longer, and the broth will thicken. Slowly reheat the stew, stirring frequently, prior to serving. Add a scoop of sour cream, and stir into the stew for a stroganoff flavor. Roll pork in flour. Shake off any extra. Season meat with salt, garlic salt, paprika, and pepper. Preheat oven to 350 degrees F. Heat oil in a large dutch oven. Add pork and brown on all sides. Cover meat with 20 oz of chicken broth, add bay leaf. Cover with lid and bake for about 45 minutes. Meat will be almost fork tender. 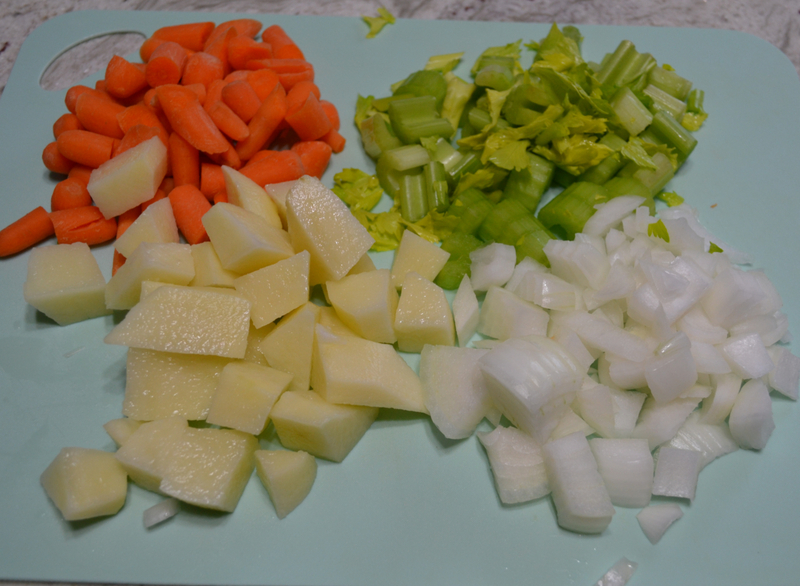 Remove pan from the oven and add carrots, celery,onions, and potatoes. Season these vegetables lightly with pepper. Remove the bay leaf. Add additional chicken broth to cover veggies as needed. (I used the total 32 oz). Cover and return to oven. Bake for 45 minutes to an hour, until veggies are tender. Add the frozen peas the last 10 minutes of baking. Allow stew to set a few hours or overnight. Reheat over low heat prior to serving. Season to taste with salt and pepper if needed. May add desired amount of sour cream into pot of stew, or add a spoonful on each bowl as serving. Stir the sour cream into broth for a stroganoff flavor. Garnish with parsley. Serves 4-6 people. Excellent served with cornbread.